Love it or hate it, hacking out involves riding on the roads for most horse owners. While it isn’t always possible to predict your horse’s reactions, it is possible to help him accept situations. It is important to be prepared for every scenario, especially unexpected ones. “Often horses will put up with constant noise. What will catch them out is something sharp, like a car backfiring,” says Ian. Keeping a good length of rein and staying switched on will help you respond quickly if your horse reacts. Mapping out a route that varies between busy and quieter areas helps to avoid over-stressing your horse. Hacking out with a friend on a steady horse can give you and your mount the confidence to deal with tricky situations. Particularly on a new route, the familiarity can help to put your horse more at ease, giving you a more enjoyable ride. Remaining calm and confident is key when dealing with cars on the road. Unfortunately, there are inconsiderate drivers on the road and you’ll likely come across them while you’re hacking. If you do, it is important to keep cool and avoid tensing up, which could further unsettle your horse. It is safer to make a note of the driver’s registration number and report the incident to the police, rather than trying to engage with the driver yourself. 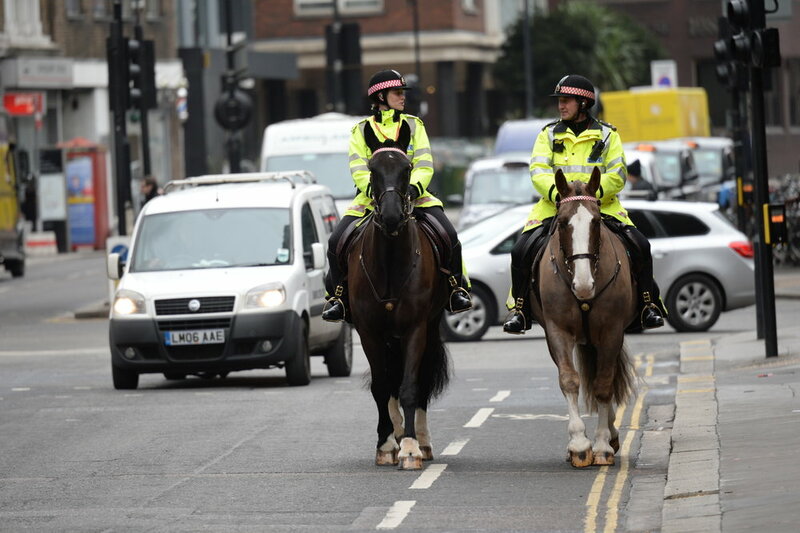 Maintaining forward momentum is rule number one for London City police horses. Horses can’t have what they refer to as an “exit attitude”, as turning or spinning can be dangerous in any kind of traffic situation. It’s worth making a note of what your horse found scary during your hack, as this will give you the opportunity to tackle the problem at home before you go out again.